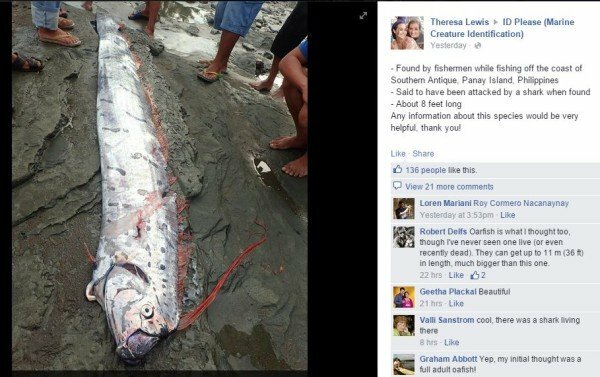 A huge Oarfish washed ashore on Panay Island was spotted by one Theresa Lewis who took photos of the rare creature. The eight-foot-long fish showed signs of being bitten by a shark. Oarfish are large elongated fish found in temperate and tropical countries and can grow up to 36ft long. Oarfish are rarely caught alive and are often mistaken for so-called “sea serpents” when in fact they are just a bizarre and rarely seen fish. In Japanese folklore, the fish are believed to be a sign of earthquake and are known as “The Messenger of the Sea God’s Palace.” Scientists are currently studying whether seismic activity on the seabed might cause them to rise to the surface. READ MORE: Messenger from the deep: Is beached fish a warning of coming earthquake?